It's going to be a good year for gamers. E3 2013 was one big coming-out party for the next generation of gaming consoles--and the party got loud. Microsoft tried its best to shock and awe the press with a bombastic press conference packed with news about the Xbox One's opening lineup, and Sony responded in kind with a laundry list of big-budget games for the PlayStation 4. Metal Gear, Call of Duty, Titanfall--no matter what you're into, there's something at the show to get excited about. But there's more to E3 than big-budget games and flashy next-gen hardware. Plenty of amazing hidden gems to play on the show floor--if you know where to look. Hohokum - A light-hearted game with a ridiculous name, Hohokum is an indepedent production for PlayStation 3, PlayStation 4 and PlayStation Vita. It's a colorful, cartoonish 2D game without mission objectives, time limits or lives. Every level is unique, and they can be explored in any order by the sinuous rainbow-tinted snake creature that you control. Some areas are genuinely puzzling, while others are more like interactive playgrounds filled with strange objects and downtempo soundscapes. While playing the game on the E3 show floor I knew I was supposed to fly through a level rescuing cartoonish homunculi, but instead I spent twenty minutes relaxing by zooming through cartoon trees to watch them spin in time with the music. 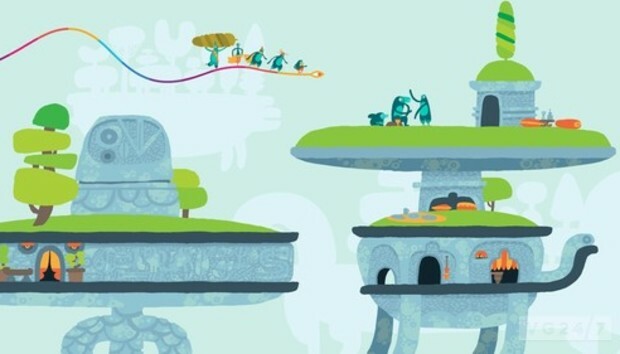 That experience alone makes Hohokum one of the best independent games of E3--it's being developed by Honeyslug Games in association with graphic artist Richard Hogg and indie music label Ghostly International Records, look for it on PSN later this year. Game & Wario - I know it's hard to believe that a Nintendo game isn't getting enough attention, but it's true--nobody is talking about Game & Wario at E3, even though Nintendo has this excellent minigame collection running on a Wii U demo station here on the show floor. The lack of attention is probably due at least in part to the fact that Game & Wario already came out in Japan last month. When every booth on the E3 floor is blasting hype trailers for the latest, greatest games, last month's games don't have a chance--even if, like Game & Wario, they haven't come out here in North America yet. And that's a damn shame, because when this game hits the U.S. market it's going to be one of the better party games American players can buy for the Wii U. Game & Wario comprises 16 minigames that can be played by 1-5 players on a single Wii U gamepad. I only had time to play a few of the minigames during my time at E3, but each one was fun and forced me to develop new ways of splitting my attention between the gamepad and the TV. One of my favorites, Gamer, challenges players to step into the footie pajamas of a young boy playing video games in bed. You must successfully play games on the gamepad while simultaneously watching the TV to make sure Mom doesn't catch you staying up past bedtime, shaking the tablet when she walks by to hide under the covers and evade notice. It's a ton of fun, and lord knows there aren't enough good games on the Wii U, so give Game & Wario a shot when it comes to the U.S. later this year. If A Tree Screams In The Forest - This is the first horror game I've ever seen that requires an Oculus Rift virtual reality headset, and it's probably the best game I played at E3. Designed and built by indie developer Aaron Rasmussen in the three weeks leading up to E3, If A Tree Screams In The Forest has a simple challenge: evade death in a haunted forest by luring a few man-eating trees to their death in a raging bonfire. The trick is, you can't tell which trees are going to uproot themselves and chase you until they start to move. And, just like Boo ghosts in Mario or the Weeping Angels of Doctor Who, these carnivorous saplings freeze when you look at them. And I mean actually look at them; since this is an Oculus Rift game, half the fun--and the fright--comes from physically craning your neck around to pinpoint where the sound of creaking roots and rustling branches is coming from before it's too late. Slip up and one of these monsters will chow down on your upper torso, ending your game with a bone-curdling death rattle so unnerving I actually jumped back and ripped the headphones off in the middle of the E3 show floor. Rasmussen was showing off If A Tree Screams In The Forest in the Indiecade booth and thus you can probably play it yourself if you visit the Indiecade festival in Culver City this October, but otherwise you'll have to wait until the Oculus Rift headsets go on sale later this year to have a chance of playing this horrifying hidden gem.